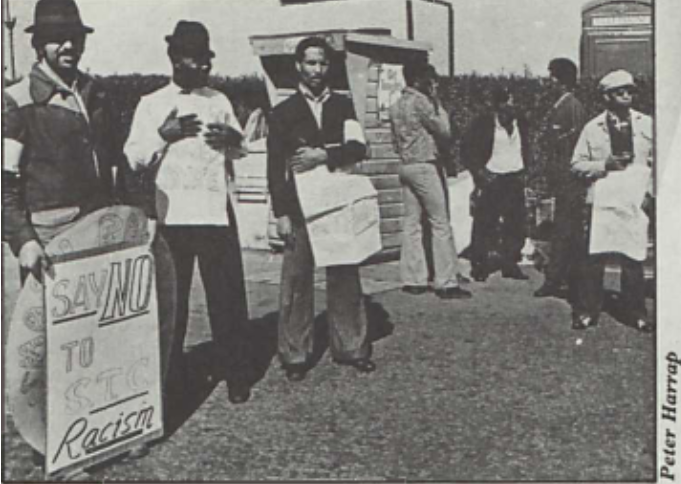 The Standard Telephones and Cables strike in 1973 was one of a wave of strikes by black and asian workers confronting both the racism of their white colleagues and management, and sabotage from their own trade unions in the 1970s. It was preceded by the Mansfield Hosiery strike in 1972, and followed by the Imperial Typewriters strike in 1974. Originally published as Racism, Discrimination and the Unions in Spare Rib issue 17, 1973. Geoffrey Sheridan was a member of the International Marxist Group who worked as a journalist for mainstream outlets at the time. There was a rumor circulating on the picket line at Standard Telephones and Cables that a shop steward in the Electricians’ Union had threatened Asian workers that if they joined the West Indians who were on strike, they would be reported to the police and deported. Perhaps the rumour wasn’t true, but the strikers were quite prepared to believe it. there was, after all, only one white worker at STC’s North London factory who had come out in support of the West Indian machine setter the members of the Electricians’ Union were refusing to train. Witnessing the events at the gates of STC would have rapidly dispelled any doubts that racialism divides the working class, shatters elementary trade union solidarity and that white workers - men and women - are deeply imbued with the ideology by which the ruling class justified Britain’s imperialist ravages and now effectively isolates an increasingly more insecure and legally deportable labour force. Now the ‘Kaffirs’ are being imported to help prop up the decaying metropolis, and the trade unions, for the most part, turn a nearly blind eye to their super-exploitation. Officially, of course, they are opposed to racialism, as dozens of resolutions passed at annual conferences attest. In reality, they do next to nothing to confront it, or to take the practical steps necessary to recruit and involve the immigrant workers rooted in industrial backwaters. ‘It would be foolish to claim that there are no instances of prejudice to be found,’ Vic Feather acknowledged when he was the TUC’s assistant general secretary in 1986. ‘The trade union movement is concerned with a man or a woman as a worker,’ Feather went on to assert in his 1970 Westminster Trinity lecture. ‘The colour of a man’s skin has no relevance whatever to his work.’ To nail down the hypocrisy and futility of these noble-sentiments (self-evident to women trade unionists), the strike as STC serves as a useful hammer. So far the management was concerned, it was an inter-union dispute. It’s hands were clean. STC is part of the Internation Telephone and Telegraph corporation, and ITT is pledged to complete equality of opportunity (not to mention attempting to sabotage national elections when it suits its multinational interests). It just so happens that half the 3,000 manual laborers at STC in North London are black, and although many of them have worked there for over 10 years, not one has been made a supervisor. Promotion of any kind - from the lower grade jobs to which the vast majority of West Indians and Asians are confined, to the skilled work which is virtually a white preserve - has involved organization and struggle on the part of the black workers themselves. But it did not begin to happen until a younger generation in the late ‘60s refused to turn the other cheek. For West Indians like Basil Spence, who worked at STC as a machine operator for 13 years until he finally quit in 1969, it was nothing but a long period of ‘frustration and discontent’. ‘I had the desire and ability,’ he says, ‘but there wasn’t the opportunity to go forward. I made several attempts to seek promotion to various types of work but in all cases I was turned down. There wasn’t the ghost of a chance for a black man to rise up above semi-skilled work. I know so many who have tried and failed.’ Lewis now runs a successful record business, and is - bizarrely - a Conservative councillor in Haringey. It was three years ago that the predominantly black machine operators in the press hop at STC decided to elect their own shop stewards, and the white machine setters - who earn £10 a week more, and have the benefit of lighter, skilled work - promptly left the AUEW to join the Electrician’s Union (EPTU). Transfers were speeded up when a white AUEW steward had his credentials removed for recommending the promotion of a white operator, instead of a black worker who had been on the job for 10 years, and when the management chose the former, there followed numerous stoppages and glo-slows until the first black was selected as a trainee setter, in 1971. Roderick Adams, a young Jamaican, was the second to be selected, after five months’ vigorous negotiation, and last winter he started his 12-months training on the night-shift, where all the setters had joined the EPT. In July, after the AUEW setters on the day-shift had agreed to train a third black worker, the EPTU stewards immediately informed Adams that his training was at an end, and the management sent him home. It was an open alliance between a racist management and racist white workers. ‘You are the niggers in the woodpile,’ the personnel manager subtly put it to the West Indian stewards, and the AUEW had little option but to make the strike for Adams’s reinstatement official. Two hundred West Indians came out, together with the white AUEW convener of shop stewards, Ted Corbett. It was the first strike at the plant for over 30 years. ‘I told the personnel manager,’ says Corbett, ‘that the woodpile he referred to was likely to become the funeral pyre of this factory if they don’t get the situation under control.’ But the management’s idea of control was a docile and divided labour force, and in the end they won. Adams went back, but he was forced to continue his training on the day shift. No doubt the EPTU celebrated. The Asian workers might have been won over if the strike had taken up the issue of the Immigration Act, and explained that by fighting racism on the picket lines, the Asians would have been fighting for a stronger union - which would help defend them against racist laws. As it was, the Asian workers at STC told Corbett that they wanted to join the strike but were afraid to do so. Instead, they became the largest contributors to the strike fund. But most blame must be laid squarely at the door of the AUEW itself. The officials made it clear from the start that they didn’t approve of the confrontation. The union’s district office told a Red Weekl reporter: ‘We are trying to cool this strike down. You buggers are trying to hot it up!’ Strike pay had a habit of not arriving on time, or simply not arriving at all. The struggle, however, is far from over. Immediately before the return to work, a day long discussion was held between the strikers and the members of the members of the black and revolutionary organizations who had supported them. One result is that a black caucus has been formed inside the factory, and regular discussion meetings are now being held, with outside speakers. Half the black workers at STC are women, and a number joined the 200 or so who initially came out on strike. Although the strike committee agreed that pay and conditions for the black women were even worse than those of the men, they had little information on what the women’s situation actually was. They work in different sections from the men, and there was scarcely any communication between them. The newly-formed caucus operating within the AUEW aims to break down these barriers. I told the personnel manager that the woodpile he referred to was likely to become the funeral pyre of this factory if they don’t get the situation under control.